Extra CUC, minutes and texts for international top ups sent to Cuba, on HablaCuba.com. It means that for every 20 CUC sent, the recipient gets 20 CUC credit, plus 50 minutes for national or international calls and 50 SMS bonus for national and international texts, except for USA. Plenty of communications means, plenty of information exchanged, which makes the borders and the distance fade away. When you’re constantly in touch, distance is just a word. The promotion will run from Monday January 29th, 2018 00:01 Cuba time to Friday February 2nd, 2018 23:59 Cuba time. Promotional Bonus can not be transferred to other lines. Promotional bonus will expire in February 25th, 2018. Promotional Bonus can be used for all services available to prepaid users like domestic and international calls, SMS, MMS, including SMS entumovil *8888, and Data (Nauta). Customers will receive a SMS a few days before the expiration date of extra bonus. Customers can check their balance via USSD (*222#) for free. From any landline, mobile or even payphone in the world, through access numbers. Through the smartphone app called KeepCalling, available for iOS and Android. The rate for international calls to Cuba is 69.9¢/min, for both landlines and mobiles, and the cost of a text message is 7¢. the great Customer Service available 24/7, both in English and in Spanish. Or, as customers put it: "Your consumer friendly instructions make it easy to cross borders and communicate with friends and family like it should be.” (HablaCuba.com customer). 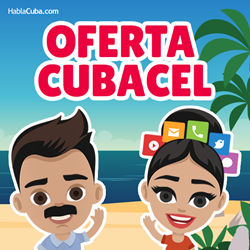 HablaCuba.com is an interactive website designed by KeepCalling, a global telecommunications company registered in 2002 in USA. Presently, KeepCalling provides its services to hundreds of thousands of consumers, with a focus on customer satisfaction. KeepCalling has been listed by Inc 5000 as one of the fastest growing companies in the USA for 5 consecutive years. In 2015 the company registered a revenue increase of over 200% from 2011 to 2014.